CHARLOTTE, NC — Inside the Democratic National Convention here it is all about winning voters in the State of Ohio. Democratic strategists now believe that if President Obama does not carry the State of Florida, Ohio is a must-win state. While Democratic leaders are guardedly optimistic about Obama’s chances in this rust belt state, they are taking no chances. 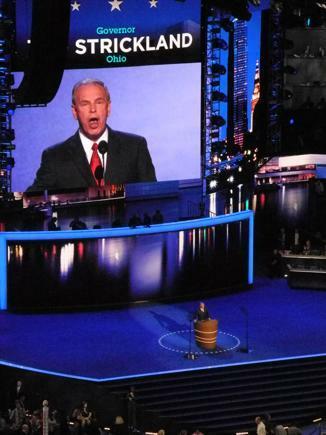 While the focus of the presidential race has been on healthcare, the Obama people refocused the debate last night beginning with a speech by former Ohio Governor Ted Strickland who reminded the packed house at Charlotte’s Time Warner Center that a billion dollar bailout by the Obama administration saved the US auto industry. The Democrats only hope that the Republicans challenge them on the wisdom of the bailout as the return of General Motors as a viable entity and the saving of thousands of US jobs is evidence that the bailout was a success. Democrats here believe this is a debate they will win. Though the bailout meant job preservation, only once during the entire evening was the word “union” mentioned. That reference came during a speech by Massachusetts Governor Deval Patrick. There is a diminished union presence at this convention which sets it apart from those in Denver and Boston. Tonight Bill Clinton takes the podium in day three.